Jean-Michel Basquiat, Banksy, Shepard Fairey, JR and the once much-maligned world of street art now has its own pantheon of pioneers whose work competes with that of more conventional artists for collectors' dollars and gallery space. What started out as "graffiti" and was condemned by many as vandalism has come of age and achieved a high measure of respectability.But a rebellious streak still runs through most of its practitioners, who revel in turning the streets we live and work in into one huge space for art appreciation - with or without the blessing of officialdom. We interview and show the work of 14 leading such creatives, all of whom have trenchant views on providing art for the people, whether or not they ever knew they wanted it. IdN: Would you tell us more about your Mirror project, what is your initial idea behind it and is there any special message you would like the audiences gain from such project? Rub Kandy: Mirror is one of the easiest and most charming magic trick we find in life. Since childhood, we have learned that looking in a mirror what you see not always you can touch. The mirror represents the magic of images and its impenetrability. Art and mirror have always confronted each other. I also mirrored images to make clear that they were elaborated, they were build on a trick and that's why I wrote it in the title, too: "the mirror"
IdN: In your opinion how did street art in general can makes social change? Rub Kandy: I like to think that art is culture and that culture is the base for social changes. What is interesting about street art is that it uses the practices typical of political activism (writings on the walls, posters, space squatting, networking) and advertising (marketing, brand identity, creative copy, shocking images, irony, repetitiveness). Obey, for example, has build a visual imaginative world superimposing the style of political propaganda to the one of advertising campaigns and summed it all up in a brand that has the shape of Obama's face. From street art you learn that with few means you can do great stuff, what’s important is to have the guts and the brain. That’s the social contribution that street art can give, not communicating ideologies but showing new ways. Certainly street art changed some practices of the traditional art world and allowed many artists to be appreciated without leaning on curators and galleries. IdN: When people look at your work and say that it borders on the line of graffiti and art, how do you see it? Rub Kandy: I'm glad if people find difficult to categorize my pieces, I find it difficult too. They are graffiti because they are often as abusive as graffiti and I often write alphabetical letters like writers do. But they are photography too because they are often made up to be photographed, in some of them I try and put living characters and then some get digital adjustments like for example the technique of mirroring. I try to make “crossover” art: one piece is called “Cross the mirror”. I just drew half the cross, then I used the mirror(ing) to get the whole shape completed. 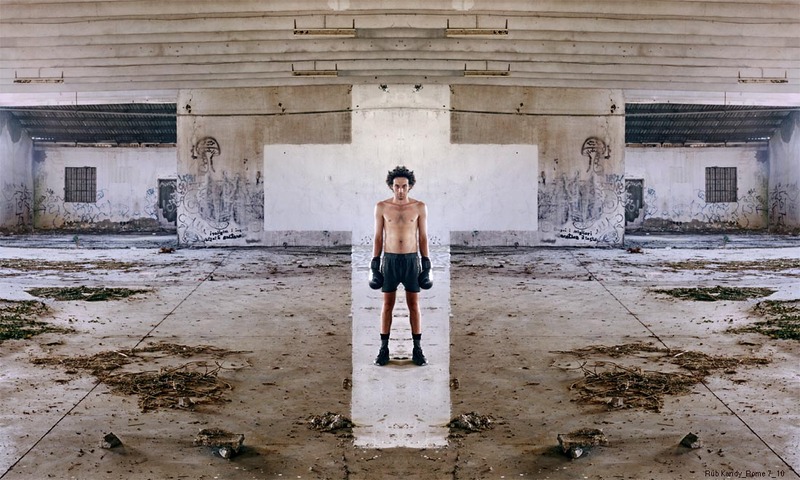 In the centre of the cross there is one Jesus with boXing gloves, the name of the model was Angelo and the mirroring of his body gives him a holy aura. You can't tell if he's a winner or a loser, if he is strong or weak , he is as impenetrable as the space he lives, an impenetrable space in which depth is in conflict with the flatness of the cross. That's how I try to make crossover art. IdN: What are your emotional associations with the environments that you depict? Rub Kandy: One of the Kids in the movie by Larry Clark (1995) has got one only desire: to deflower young virgins – to enter where nobody has entered before. On the contrary the places where I like to enter has got plenty of experience, but I like the idea of possession, to walk there alone, I think everybody knows what I'm talking about: the taste of something of your own, the curiosity to know it, the fear to break through some doors and meet the unexpected, finding clues of what it was before and the romantic charm of ruins, like when English painters came to Rome to depict the ancient ruins of the Roman Empire, that's how I like to walk through the ruins of the Industrial Era. On the technical and practical point of view it's important for me to work in wide open space where I can experiment freely. I don't have no studio: every place is my studio. Moreover industrial structures are full of scenographic elements: wings, columns, straight lines that I use to build up my work space. Every piece of mine requires a day of work: morning to evening. When I enter a place I don't have no specific idea of what I'll do, I waste a lot of time looking for the right angle. Then I choose the easiest idea and then I start to work quickly. Before evening I shoot. I often make mistake and I throw it all away. 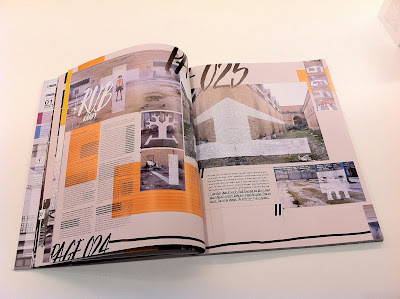 IdN: Do you feel street work is more authentic than gallery work? How do you elaborate the different affection these two venues brought to the viewers? Rub Kandy: If you trust the wrong gallery you'll end creating bad pieces, galleries often aim to just get an immediate revenue and they lead the artist to do commercial works to satisfy their clients. It's fair to live on art but it is better when galleries work well, making themselves and the artist rich and enriching our culture. But the wrong art dealer and the wrong buyers could lead the artist to abandon experimentation. Same old story since the '80s: great writers and street artists that were powerful on the street started doing paintings on canvas to satisfy little mean art dealers and buyers. Maybe they wanted to become like Basquiat, to go to bed with Madonna, but Basquiat is Basquiat, an angel with boxing gloves, chosen by God, and drawing on a train is not like drawing the same thing on canvas.A street artist that has painted 200 trains shouldn’t sell himself out at a low price to a gallery. Don't misunderstand me, please, it's not ethical fundamentalism, it's just a matter of economics. A street artist is worth for what he does on the street, that's where he makes his experimentation and I'm happy if he's powerful even when he happens to work for a gallery. Anyway, the question art/street art will always be a great deal, but maybe it’s just a matter of stopping talking about it and start thinking that every artist is different from the other. IdN: Graffiti was once label as vandalism, now more and more people appreciate them as art, what would be your intake towards such evolution and how do you foresee graffiti / street art’s future? Rub Kandy: A many others, I started doing graffiti and what I’ve seen in the world of vandals is fantastic. I admire and envy their energy: they’re young, beautiful, crazy, they attack trains, I regret their energy, that I’ve lost. While art schools got rotten Bronx style spread among kids, while in schools they taught about De Chirico in the streets they talk about rhythm and lettering. Many powerful artists, graphics, designers come from that underground world, among vandals they’ve learned what teachers didn’t teach them. Some people keep on distinguishing betweenVandals and Artists, they say you should arrest the former and buy works from the latter. That’s why some idiots during vernissages buy the same pieces that they want to be erased from the walls of their house. Somebody told them the first is art, not vandalism and they are fine. That’s the same old story.